All That Glitters Gemstones Appearing in Books/Magazines - Many are Currently Available for Purchase! 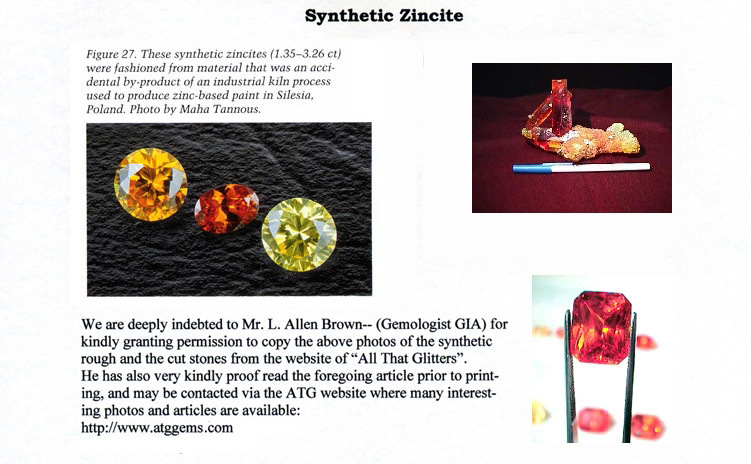 Many of our gemstones have appeared in publications such as Gems and Gemology Magazine by GIA, Jewelers Circular Keystone (JCK), Cedar Wings Magazine (published as an in-flight magazine in the Middle East where all photos of gemstones/rough in the article came from the All That Glitters' Inventory! ), and many more. Our gemstones have appeared in two editions of "Gemstones - Understanding, Identifying and Buying". 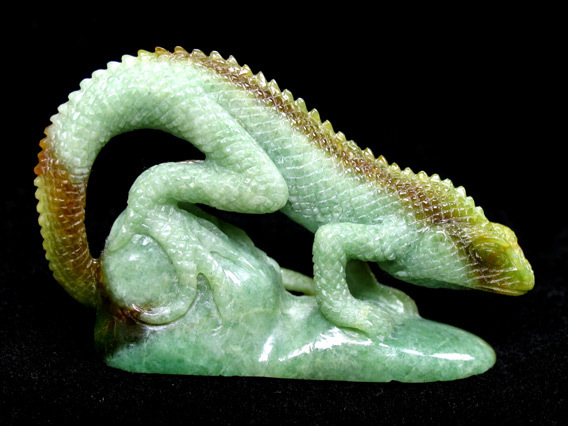 There are collectors out there who desire to collect gemstones that have been published and seen throughout the world. Many people enjoy sharing their personal gemstone treasures with others, whether it is an unset gemstone in a collection or set into a piece of fine jewelry. It is a thrill for most to open a book or magazine and show a photograph of the very gemstone that they are showing to someone! 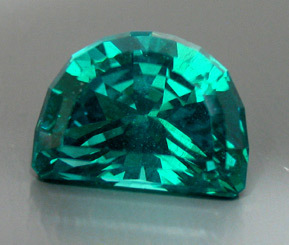 Though All That Glitters gemstones are very often unique and rare due to size, color, clarity, polish and cutting, a few are even more special because they can be found in international publications. They are very much like a work of fine art which is known to belong to a museum - in this case, they may not only be found in some museums, but perhaps in your home or the home perhaps next door to you! Many of the prices below are more in line with a retail price vs. a gemstone that has been published. 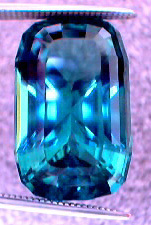 A retail estimate is difficult to determine on many of All That Glitters gemstones, because they are typically very unique due to size, cutting, clarity, color, etc. As one famous jewelery stated before - All That Glitters gemstones are "so exclusive and one of a kind, that our customers would not be able to "price shop". Visiting another business and finding a similar gemstone is impossible." Pricing has been based on the normal wholesale with an added percentage due to the publication of the photo. Overall, the prices are very far below where one would expect them to be, and may change at any time. It is not the norm for a business to have so many gemstones published in trade magazines and books, but this is indeed the business of All That Glitters - dealing in Fine Faceted Unique Colored Gemstones! 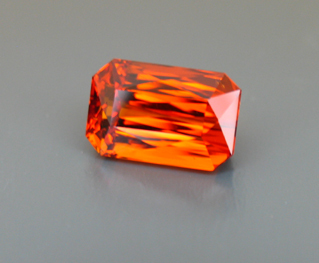 This deep orange ctirine with red highlights (under incandescent lights), is the finest color that we have seen. This is all that we currently have available. 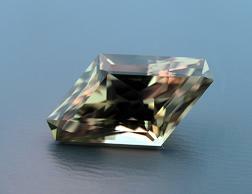 The first piece that was faceted, was photographed for Cedar Wings Magazine and sold to a collector. See photo and info below. Just back from our cutters. This deep orange gem with red highlights (under incandescent lights), is one of the finest colors that we have seen. We only have three more pieces like this in the rough. 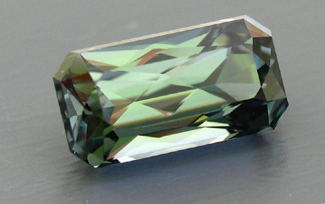 This is the first to be faceted. Be the first, and one of only a few, to own one of these special pieces! (mannog-05-01x) SOLD! Photo appears on two different pages! 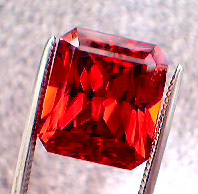 Here are the cutters comments regarding this gemstone after he faceted it! 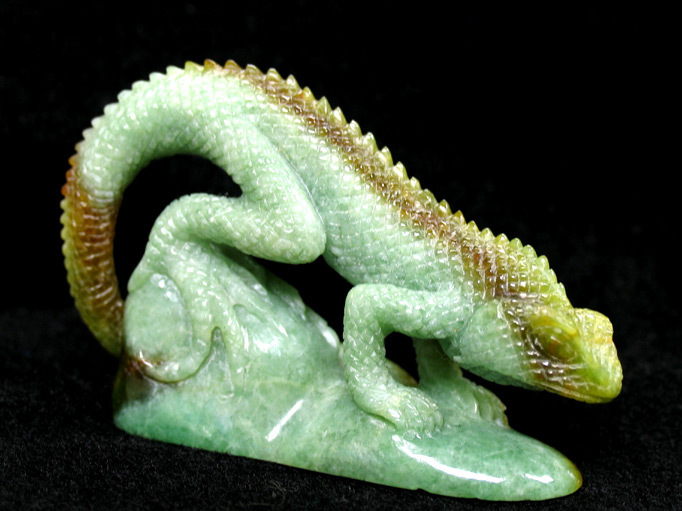 cool stone .... the color shift and the flash of the cutting is really fantastic.... the photo's are good but can't show the scintillations that this chameleon of a stone possess..."
These gems are from the famous 1972 Tourmaline Strike in Newry Maine. The material came from one of the original miners. We traded an 18kt gold two tone ring with a center orange diamond flanked by two nice round diamonds for these two beauties.. The colors, cutting and shapes of these two pieces are a match! 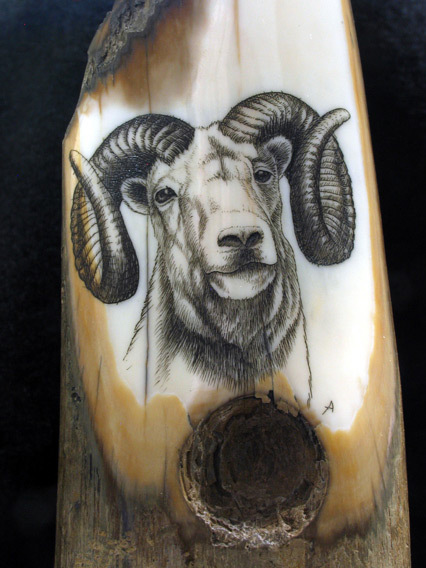 Would be wonderful for a ring and pendant. 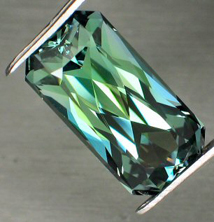 Fine colored larger Maine Tourmalines are now frequently being sold at $1000/ct. These gems are from the famous 1972 Tourmaline Strike in Newry Maine. We obtainedboth pieces of rough from one of the original cutters that faceted the material for those responsible for this famous find. 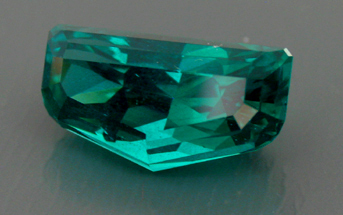 He was paid with a piece of rough which was of similar size to what he had faceted for them - in this case the smaller of the two gemstone. The large 12.41ct All That Glitters had faceted from a piece of rough purchased from the same person as noted above, but was originally purchased in the 1970s as an investment and piece of Maine history from Frank Perham. 2.43ct Pink Tourmaline with Watermelon Tourmaline slice image! Note - The second photo has been enhanced in saturation to show off the watermelon slice. 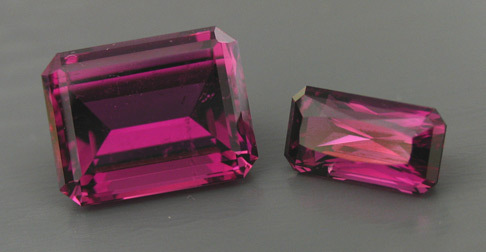 The first photo is more accurate for the body color of the tourmaline, slice, etc. 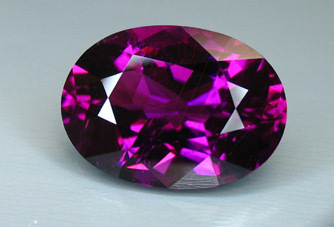 10.28ct Oval Amethyst Purple Tourmaline faceted by our Supreme Master Gem Cutter, Stephen Kotlowski. (pntrd-08a-01a) Though now a well known gemstone due to it's publication, we still currently have it at the wholesale cost of a well known West Coast business. (Priced back in 2007) Call or email if you have an interest. Only one like this! 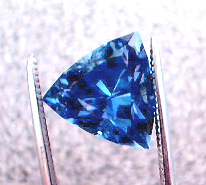 Almost a 13ct ct Neon Apatite!! A wonderful piece of art and antiquity. Signed by the artist. Purchased decades ago. A wonderful piece of art and antiquity. Signed by the artist. Purchased decades ago. The back has more of these holes, which most likely were made to make fire. What is Fordite? 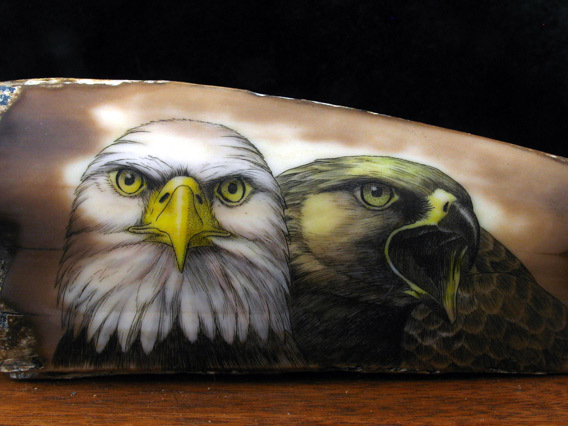 People have been requesting more of the Fordite we purchased a number of years ago. We encountered it by mistake and thought it was fascinating and beautiful, plus part of history. The supply is limited and when it is depleted, that will be the end of it. This material has come from the walls of the Ford company in the US and UK. When Ford sprayed their automobiles, the layers of paint would adhere to the walls. Over many years, this built up and had to be removed. It has hardened over the decades and with experience, one can remove the layers to release the inner beauty related to the colors of vehicles that were painted in the 1950s and 1960s. Since the process for painting has changed, this material will no longer be created, so it is truly a very limited supply. Again, All That Glitters was fortunate to find a person who had some of this material stashed away for decades. The owner of All That Glitters chose the best colors and designs. All of this material has some metallic paint, so it may glitter - this is actually what you want to see! From another individual, we did see one piece of the material at a good price, but it didn't look right - it did not have the layers that we expected, nor did it have the metallic paint. Think it was meant to deceive and to fool the unsuspecting into thinking that it was Fordite. We have a few pieces of Fordite that we were very lucky to find. 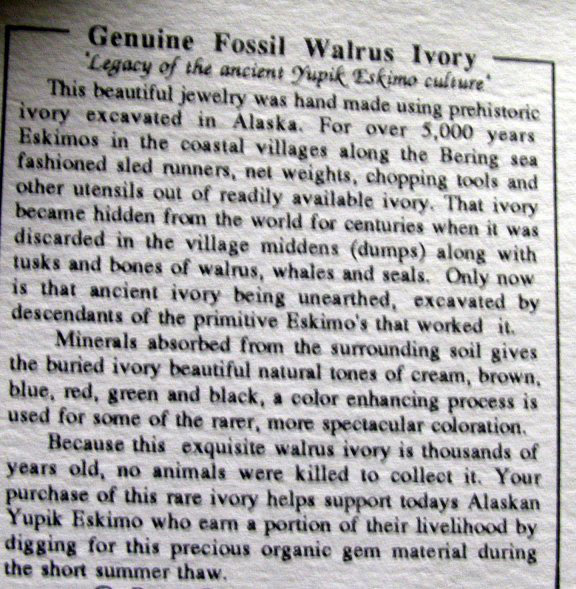 After selling the above group to a dealer making jewelry from this material, we were without any examples of this unqiue American material for about 5 years! A few very fine examples were available and All That Glitters grabbed them. 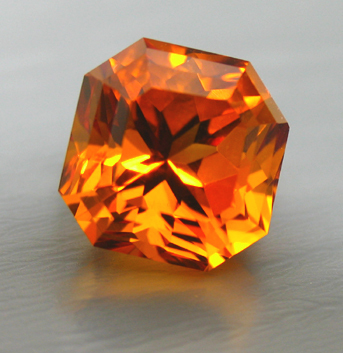 9.24ct Radiant Cut Zincite - SOLD! 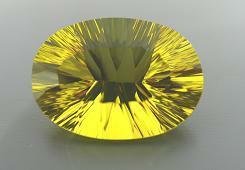 Visit our Faceted Zincite Page - we may be the only business who is faceting this interesting material! 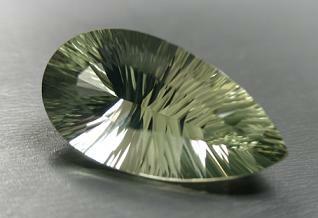 2.94ct Trilliant, U.S. Faceted - A beauty! (neg-03-03) $3,675 *** Note - this gem was featured in an article published in the May Issue of Jewelers Circular Keystone (JCK) Magazine. 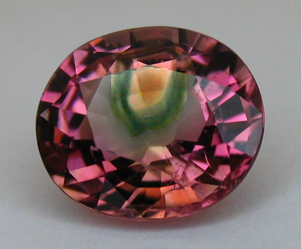 The color of this gem was originally green. 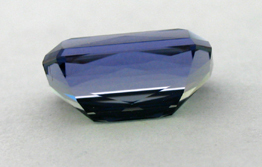 Heat changed it to the color that most expect Tanzanite to be! 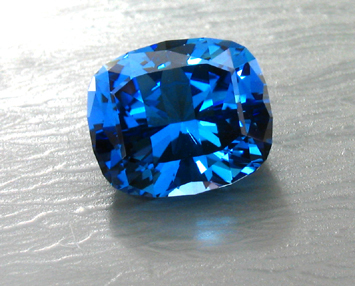 Most Tanzanite is found in the earth as a brown colo. 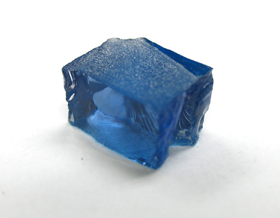 It is heated to produce the blue/purple color. 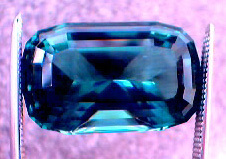 Naturally occurring Tanzanite can be brown, blue/purple, green, yellow and pink. 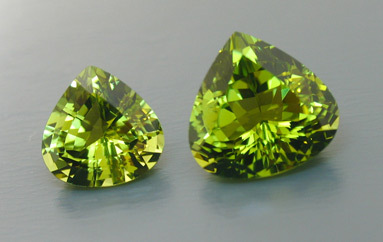 The All That Glitters Neon Apatites have received much press because of their size, color and clarity. This one falls into that category too, but it was also faceted by our Master Facetor (Stephen Kotlowski). Each facet meets perfectly. 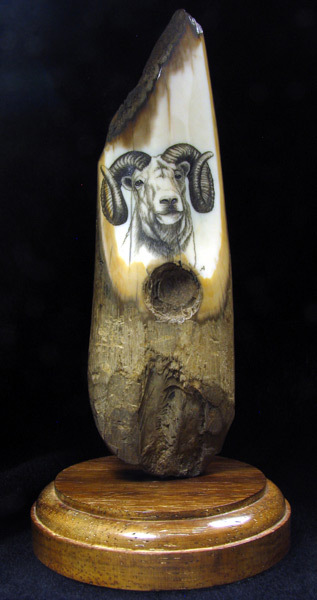 The future owner could enter this piece into one of the annual cutting competitions. 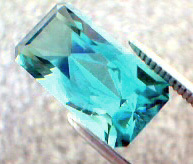 11.33ct Neon Apatite - U.S. Cut! May appear in Gems and Gemology Magazine in the future! 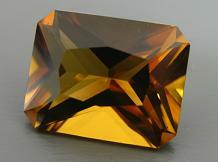 16.64ct Deep Honey Quartz - $1,165 SOLD! 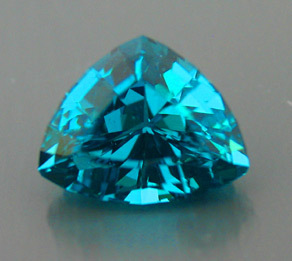 Like most of the fancy colors being seen on the market for the past few decades, this color is enhanced in a similar way at times as blue topaz is. 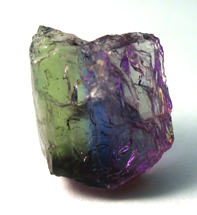 Tourmaline from the Congo - Africa! 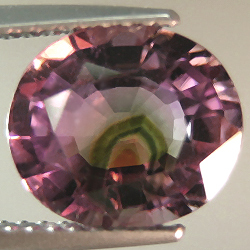 This tourmaline is from the new find of tourmaline making its way into the wholesale market currently. After faceting, it will eventually trickle down to the retail stores and then the public. 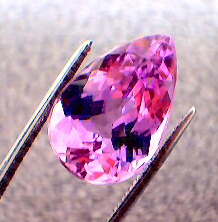 Like all other gems, this material has it's fine quality as well as lower quality. 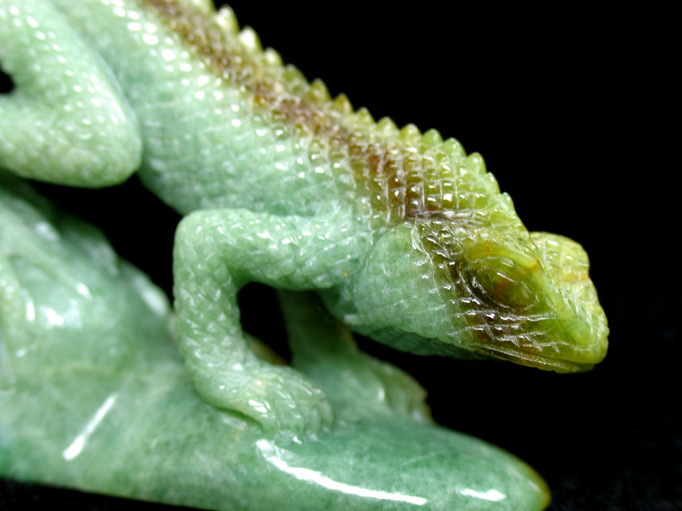 This is a wonderful example of the color, which can be a very pleasing green with blue. Like many of these fancies colors, there can be some inclusions. This has a few but the cutting hides them under most conditions. 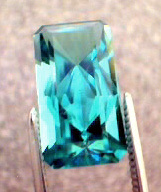 The cut is a newly designed called a Switch Back Emerald Cut. It will twinkle and the flashes of light will bounce rapidly from the top of the stone to the bottom of the stone as it is tilted. A very unique cut! 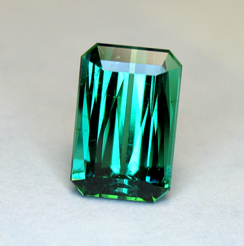 This is a large, well cut, teal to green Congo Tourmaline measuring 14.55x9.50x7.22mm. 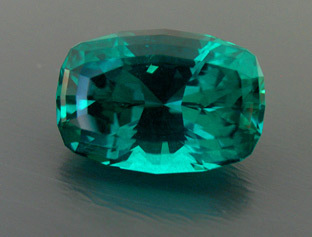 (hilbos-04a-01) Note - this is the nicest piece of Congo Tourmaline we have seen and a very fine color for Tourmaline. 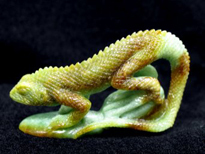 Camille the Two-Toned Burmese Jade Chameleon - Currently All That Glitters Mascot! "You have continued to go above and beyond for me and I don't want to trouble you....you've been so wonderful really....so companies don't carry semi mounts in rose gold.....I know I can trust you which is why I would want to business with you.....Always appreciative. " "I have been sending periodic reminders to the gemologist working on the fading topaz, and he has assured me that he'll be completing the report soon for G&G. The Summer issue is now being printed, so hopefully we'll be able to include the entry in the Fall issue. I'll send a draft for your review when it is ready. Thanks for your help.."
"CD received this morning with many thanks, a good selection. I will be going through it shortly and will let you know those photos I would like to use"